The end at least of this phase is, in theory, in sight. By 2021, China will be delivering its first centennial goal: becoming a “moderately prosperous” country. That at least does not stray far from the vision of Deng in the early 1980s, right at the start of China’s own epic re-pivot back into the world after three decades of snarling discord and isolation. As a recent biography of China’s former paramount leader by Andrei Pantsov and Stephen Levine makes clear, these were pretty much the terms that Deng set – albeit with far lower per capita GDP expectations. The Deng vision still presides today, despite all the grand statements made about Xi Jinping being as, or more, powerful, than him. Deng also set in place China’s largely cooperative relations with the wider world. Under him, détente with the U.S. moved to full diplomatic relations in 1979. In the 1980s and 1990s, China barely used its veto powers on the UN Security Council. War with Vietnam in 1979 and skirmishes five years later were the last real military action the People’s Liberation Army have seen. The 1989 uprising and its violent suppression masks this, but on the whole, since the 1980s China has been a peaceable, integrating, and co-operative force. Its bark has been far worse than its bite — indeed, it has hardly bitten at all. The reward for this is the economic development that has, at least till recently, gone well. China has grown richer and more influential, practicing the ultimate precept from Sun Tzu’s Art of War, that ancient manual on winning battles largely without physically lifting a finger. It has let ships freighted with trade and currency flows in its favor, not battle armadas and military assaults, conquer the world. This process has been serendipitously accompanied by a largely benign, stable external environment. Despite glitches, from the Asian Financial Crisis of 1998 to the global one almost a decade later, on the whole, from its most important markets like the U.S. and EU to its main regional partners from Japan to South Korea, China has been dealing with stable political systems where the greatest challenges thrown up have simply been changes of government, not political systems. Ironically, for a non-democracy, China receives huge benefits from the democracies ranged around it, which constitute its most dependable and important economic partners, despite the search for new markets in Africa and Latin America. 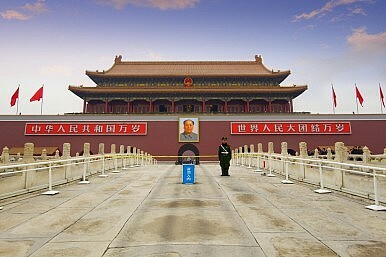 In many ways, China relies on their rule of law and stability. The country is parasitical on systems that Beijing domestically declares are unfit and unsuitable for it. The brutal fact is that the greatest source of unpredictability for China is itself. Policymakers in the U.S., U.K., Australia, and most other democracies roughly know what sort of political and economic system is likeliest to prevail in their countries in two to three decades’ time. For all the talk of Chinese leaders being able to think long-term, while electoral democracies cannot, this is only half the story. Policymakers in democracies don’t have to think too much about many big issues that their counterparts in China do – like legal development, tax systems, and the fundamentals of governance – largely because their systems have enough inbuilt predictability for them not to worry overmuch about these things. Instead they deal with daily, smaller issues. This is not a weakness, but a luxury — one that the Chinese would dearly love to have. For China, it would be a brave person, inside or outside the country, who would essay a guess as to what political system might prevail in a decade’s time, let alone two or three. This does not mean the inevitable acceptance of multi-party democracy in the country. Instead, it’s an acknowledgement that, far more regularly and passionately than their western counterparts, Chinese politicians talk of the need for reform almost every day. China’s leaders know that the system they have at the moment needs fundamental change, even if there is no clear blueprint about where they are going and how to get there. Politics in China is the root cause of domestic unpredictability, and lies at the heart of the need for minimum trouble outside the country. Of course, there are spillover issues, as recent years have proved, particularly in the South China Sea. But the rule that domestic imperatives largely drive China’s so-called “assertiveness” in its region, and that this in some senses is simply an export of its own domestic issues beyond its borders, is the strongest explanation for this sometimes ostensibly self-defeating behavior. The bottom line is that Chinese investment and involvement in the territories of others like Australia or America are motivated largely by China seeking stability vicariously, rather than evidence of Beijing trying to change the world to match the system that it currently has. A world which behaved and was constituted exactly like China would, in more ways than most realize, would truly be China’s worst nightmare.